મંગળ પર જીવનની શક્યતાઓની તપાસ, તેની આબોહવા, ભુસ્તરશાસ્ત્રનો અભ્યાસ અને મંગળ પર માનવ મીશન માટેની માહીતી એકત્ર કરવા માટે તા. ૫ ઓગષ્ટ, ૨૦૧૨ના રોજ મંગળ પર ‘ક્યુરીયોસીટી રોવર’એ ક્ષતી રહીત સફળ ઉતરાણ કરીને પ્રારંભીક તસવીરો મોકલી હતી. નાસાના વૈજ્ઞાનીકો અને ઈજનેરોનું આ પરાક્રમ રોબોટીક અવકાશયાનના ઈતીહાસમાં એક સૌથી પડકારરરુપ સીદ્ધી છે, અને ગ્રહીય સંશોધનના નવા યુગ માટે દ્વાર ખોલ્યું છે. આવો ‘ક્યુરીયોસીટી રોવર’ના બે વીડીઓ માણીએ અને ‘નાસા’ના વૈજ્ઞાનીકો અને ઈજનેરોને અઢળક અભીનન્દન આપીએ…. નાસા સંસ્થા ની અનુપમ સિદ્ધિ અને તેની ટીમ નો જ્વલંત વિજય લેખી શકાય… જે માનવ જાત ની પણ મોટી સિદ્ધિ ગણાય તેને માટે કોઈ બે મત નથી..
ચંદ્ર પર માનવ ને ઉતારવાનું અને ચંદ્રના ખડકો પૃથ્વી પર લઈઆવવાનો કાર્યક્રમ ૨૦ મી સદી ના ૭૦ ના દાયકા ના મધ્ય સુધી ચાલ્યો પછી સ્થગિત કરી દેવામાં આવ્યો હતો..
કારણ કદાચ એમ હશે કે તેનો માનવજાત ને માટે તેનો કોઈ ઉપયોગ નહિ જણાયો હોય..
મંગલ પર પ્રયાણ ની સિદ્ધિ બાદ તેના કાર્યક્રમ માટે ની આર્થીક ગ્રાન્ટ ઘટાડી નાખવામાં આવી છે.. તેવા સમાચાર સી એન એન ની ખબરો દ્વારા પ્રસારિત થયા હતા જે મેં સાંભળ્યા હતા..
એક બાજુ વિજ્ઞાન ની હરણફાળ અને અનુપમ સિધ્ધિઓ અને બીજી બાજુ માનવ જીવન ની સમસ્યાઓ ના ઉકેલ ના પ્રયાણ તે બંને સમાંતર ચાલ્યાજ કરશે..
જયારે સંસ્થામાં વૈજ્ઞાનિકો અગ્રેસર હોય છે..ત્યારે દરેક પરિસ્થિતિ માં પ્રગતિ ના નવા સોપાનો સર કરાય છે..અને જયારે હિસાબનીસો અગ્રેસર બને છે.. ત્યારે સંસ્થા બંધ કરવાના વારા આવે છે..
વિજ્ઞાનિક હરણફાળ થી હટીને નાસા સંસ્થા નેવું ના દાયકામાં ટુરીસ્ટ એટ્રેકશન બની રહી હતી તે મેં જાતે ટુરીસ્ટ બની ફ્લોરીડા માં જોઈ હતી..
વૈજ્ઞાનિકોની હરણફાળ જળવાઈ રહે .. એજ અભ્યર્થના .. I am thankful for this presentation for our friends. I wish our friends know about our own GUJJU, who is one of the scientists who successfully launched this rover to Mars.. He is Dr. Kamlesh Lulla. (From Vadodra). Please enjoy this……. Dr. Kamlesh P.Lulla is an internationally known NASA spce scientist and an expert in geospatial technology. In 2005, Dr. Lulla received the highest NASA honor- the Exceptional Achievement Medal for his scientific contributions. Dr. Kamlesh P.Lulla is the Chief Scientist for Earth Observation in the Human Exploration Science at Johnson Space Center. Dr.Lulla directed the Earth Observations Science activities from the International Space Station. Dr. Lulla’s team trains astronauts in Earth and remote sensing sciences for the all flights. Prior to assuming the duties of the Chief Scientist for Earth Observation, Dr. Lulla served as Chief, Earth Science Branch and as the senior Lead Mission Scientist for Earth observations for the Space Shuttle Flights. As a team leader of astraunaut trainers and briefers, he coordinated the acquisition of scientifically useful imagery and data. Dr. Lulla holds two Ph.D. degrees and combines his expertise in Earth and Space sciences in operational and research activities at NASA. He served as a Senior Professor and Director of space Remote Sensing Research Center at Indiana State University, Terre Haute, Indiana before joining NASA JSC in 1988. Dr. Lulla is a widely published author. He has coauthored four books and authored nimerous papers/ reports ( over 200) in international scientific journals/Publications. He is also the Chief Editor of Geocarto International-a major international journal in Earth Science Remote Sensing and a Guest Editor of American Journal of Photogrammetric Engineering and Remote Sensing. Dr. Lulla currently serves as the Chair of Technical Committee of Houston Section of American Institute of Aeronautics and Astronautics ( AIAA). Dr. Lulla has received numerous awards from NASA, the U.S.Government and various Universities and Associations. Among his many honors, he received NASA’s ” Manned Flight Awareness Award” in 1993 and Houston Federal Executive Board’s “Federal Scientist of the Year Award” in 1992. He also received the India Culture Center of greater Houston’s award for ” Outstanding Professional Achievement” in 1990 and Cultural Festival of India award ( United States) in 1991. Indiana State University conferred upon him the ” Distinguished Alumni” Award in 1991. Dr. Lulla has received several awards from professional societies such as The American Institute of Aeronautics and Astronautics,( AIAA), American Society of Photogrammetric Engineering and Remote Sensing,(ASPRS) and Association of American Geosciences (AAG). In 1996, Dr.Lulla received the prestigious Space Remote Sensing Geospatial and information Science societies Achievement Award at Ninth Lukas Symposium on Geosptial and Information Science Societies and Presidential Citation from the American Society for Photogrammetry and remote Sensing at Washington D.C.
Having known about this Gujarat’s PANOTA-PUTRA, let me tell…..He has specifically asked those astronauts, including Sunita Williams, Dr. Kalpana Chawla, to take maximum photos of Gujarat state with minute details. He showed those minute details of Vadodra City and many others. He emotionally said…Vadodra is my MATRUBHUMI. He is currently writing a book in Gujarati……. Synopsis: Dr. Kamlesh Lulla certfies that you have viewed ” Gujarat From Space” on a simulated space shuttle journey during the Chalo Gujarat, 2008 at Edision,NJ,USA. His two poems I have presented in the last ABHIVYAKTI episod. TIME magazine dated August 20,2012. Cover page: MARS. What we can learn from a robot 154 million miles away ? by. Jeffrey Kluger. LIVE FROM MARS. A one-ton Rover can teach us a lot about the RED PLANET – AND THE BLUE ONE TOO. Curiosity will begin its search for the chemical building blocks of life on Mars. Let me give one basic info regarding Mars from this issue of TIME magazine and invite my friends to participate…. MARS MAY BE A METEOR-BLASTED DESERT today , but it was once a very different place. Its surface is marked with dry riverbeds, empty sea basins and dusty oceons. Strip away 99% of Earth’s atmosphere and boil off all its water and it would look a lot like its desiccated cousin. Mars was wet for at most a billion of its 4.5 billion years, but as the early Earth proved, that could be enough time to cook up life. Let us salute the Scientists…Science and those who promote science….THE ONLY TRUTH. In my personal meeting, Dr.Lulla has cautioned the people on this planet Earth…..on………. (1) In future, Man on Earth will not face problem regarding OIL, but it will be regarding WATER. (2) In coming years, a Neurosurgion will need an Electronic engineer’s presence next to his table and help to perform a Brain Surgery. Remote controlled surgery. તમારો 16/09નો મેઈલનો આજે પ્રત્યુત્તર આપુ છું તે માટે માફ કરજો… ગુજરાતમાંથી પ્રકાશીત થતા રૅશનલ સામયીકો અને રૅશનલ સાહીત્ય માટે ઈ.મેઈલથી વર્ડફાઈલ તેમજ એક રૅશનલ ગ્રંથ ‘વહેમ–અન્ધશ્રદ્ધા નીષેધ’ની પીડીએફ મોકલું છું. જે મળ્યેથી પ્રત્યુત્તર પાઠવવા વીનન્તી..
Well, first, it is indeed amazing. Second, I got news for you. This video is OLD and is for the Mars Exploration Rover (MER) project that was launched in 2005 and placed “Spirit” and “opportunity” rovers on Mars. The landing technique was first used on Mars Pathfinder project that landed “Sojourner” rover on Mars in around 1995. The “Curiosity” rover just landed on Mars on August 5, 2012 is much larger rover (Almost VW Bug Size) than any of the rovers landed on Mars before. The technique shown in the video circulating on internet was not capable of landing Curiosity on Mars. JPL had to come up with many times more complex landing technique that used Heat shield, Guidance system, Parachute, Sky Crane and Thrusters. The airbag landing approach shown in the video circulating on the internet would have simply resulted in busted airbags and large craters on the Mars instead of gently lowering “Curiosity” on the Mars surface. So, The latest technique used to lower the Rover on Mars (August 5, 2012) is even more amazing. You can see that and many other latest Mars video at the following website. If you spent 6 minutes watching the internet circulation, you must see the following video to realize how amazing it really is! Thank you very much for giving us a glimpse of Mars exploration. Some laymen like us do Not understand the Technical aspects of it , but understand the Practical Utility to Human beings. Science is the basis for Rationalism and as such I admire the space exploration. Unfortunately, the Economic Situation has led to curtailment of Funds, But we hope that it will be for a very short period of time. With regards. I m shivpatel.I m studying in 12 science. I have seen ur mars planet project.I m really like it .I want to knw abt it more.iI have seen all episode of mars on discovery. આપની આ પોસ્ટમાં જાણવા જેવા સમાચાર પણ છે અને આપની વૈજ્ઞાનિક દ્રષ્ટિની ઝલક પણ. ગોવિંદભાઈ! આપના વાચન અને વિચારોને આધારે આવા લેખ વારંવાર લખતા રહો તો આપની લેખનશક્તિ- વિચાર શક્તિનો બહોળો લાભ વાચકોને મળે. જ્ઞાનનો પ્રસાર પણ થાય. આ બ્લૉગ પર જે ઠેર ઠેર ઝલકે છે અને આપના જીવનમાં જે વણાઈ ગયેલ છે તે આપની વિચાર શક્તિ મને પ્રશંસનીય લાગે છે. આપના બધા વિચારો સાથે હું સંમત નથી થતો અથવા નથી હોતો, પરંતુ ‘ગોવિંદ મારુ’ એક રેશનાલિસ્ટ તરીકે, અને તેથીય વિશેષ એક માનવતાવાદી ‘માનવ’ તરીકે મારા દિલની નજીક રહે છે. ઠાલી વાહ-વાહીની વાત નથી, પણ પોતે જે શુદ્ધ બુદ્ધિથી વિચારે છે અને જેને સત્ય માને છે તેમાં માનવીની નિષ્ઠા હોવી જોઈએ. આપની અભિવ્યક્તિમાં તે સચ્ચાઈનો રણકો છે. આપે ‘ઘેટાં-સમ’ અભિગમથી દૂર રહીને વાચકની સ્વતંત્ર વિચારધારાની જે રીતે પુષ્ટિ કરી છે, તે માટે સલામ. 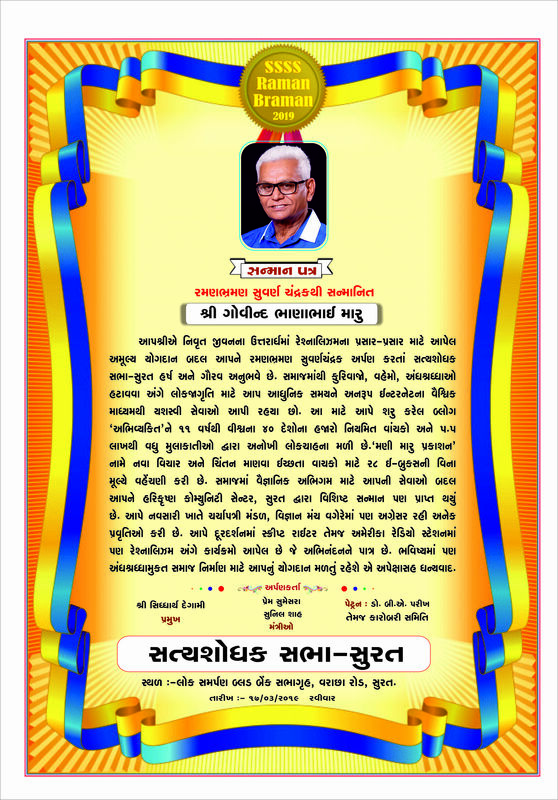 આપનું મરણોત્તર વીલ હૃદયને સ્પર્શી જાય છે. સમાજ જ્યારે ઘરેડમાં ચાલવા લાગે છે, ત્યારે લોકમાનસ મૂર્છામાં જવા લાગે છે. આવા સમયે સમાજને ‘આલબેલ’ની જરૂર રહે છે. ગોવિદભાઈ, આપ અને આપના મિત્રો આ કાર્ય કરો છો. મિત્રભાવે આપ સૌને શુભેછાઓ પાઠવું છું. માફ કરજો! ગોવિંદભાઈ , થોડું ઉમેરું? મેં ઉપરની કોમેંટ લખી અને ઉપર જ બારમા ધોરણના કોઈ વિદ્યાર્થી મિત્રની કોમેંટ પર નજર પડી. મને તે ખૂબ ગમી. કોઈના જ્ઞાનમાં વૃદ્ધિ થઈ શકે તે કેવું સરસ કામ! અજ્ઞાન અને અંધકારનો નાશ કરવો તે જ બુદ્ધિમાનનું કામ. કોઈ ઘોંઘાટિયો પ્રચાર કર્યા વગર, કોઈ વાડો કે ખેમો ઊભો કર્યા વગર, પોતાના વિચારોની કેદમાં કોઈને બાંધવાનો મોહ રાખ્યા વગર જે સત્યની શોધમાં પોતાના માર્ગે અવિચળ ચાલે તે સાચો બુદ્ધિમાન. આપનો લેખ એક વિદ્યાર્થીના જીવનમાં કંઈક ઉમેરી ગયો તે આપની ઉપલબ્ધિ.